from surgery through to completion, in-house. If you are in need of dental implant surgery, our Dental Centre in Subiaco, Perth offers a range of implant treatments, from surgery through to completion, all performed in-house. Practice principal Dr Misagh Habibi (Dentist) leads an experienced team of oral health professionals dedicated to providing outstanding patient care and offering appropriate treatments to restore your dental health. From the replacement of a single tooth to full mouth reconstructions using dental implants, you will be in experienced hands from start to finish. Dr Habibi restricts his practice to implantology and oral (dento-alveolar and periodontal plastic) surgery. He is an educator and researcher in this field, is highly trained and experienced in dental implantology, and a Board endorsed IV sedation provider. He is a Master (MSc) of Oral Implantology, Honorary Clinical Consultant to the University of Western Australia, Fellow of the International Congress of Oral Implantologists and an Academic Tutor for Implantology at Goethe University, Frankfurt Germany. His services include advanced dental implants and full mouth rehabilitations using 3-D computer planning, gum grafting, bone augmentation, grafting and regeneration, and sinus elevation (sinus lift) procedures to facilitate more complex treatments. Our dental implant surgeons Dr Habibi and Dr Mascarenhas are registered as general dentists and have many years’ professional experience and postgraduate training, having performed thousands of implant procedures at our Perth clinic. Our Perth dental centre provides IV sedation or sleep dentistry for the comfort of patients during oral dento-alveolar surgery. Procedures such as single teeth replacement can also be performed under local anaesthetic only, depending on patient preference. Broswe through some of our case studies. The first step is to meet with Dr Habibi for an assessment of your situation, history, requirements and preferences. Treatment recommendations and information about costs and options are provided at this stage. Radiology referrals for x–rays, cone beam imaging or CT scans may be organised, if required. Patients should be aware that all surgical procedures carry risk. Before starting any recommended dental treatment, patients may opt to seek a second opinion. Results can vary and the effect of alternative treatment options (including no treatment) should be considered. Surgery – Once you are comfortable to move ahead with a recommended procedure, the initial stage of inserting teeth implants is undertaken. IV sedation or sleep dentistry techniques ensure this stage is comfortable, and will minimise any pain. This stage will take around 1–2 hours depending on the number of implants and whether associated bone grafting or modification is required. Surgery can often be done in one stage, but some cases may require a two stage surgery where the implants are initially left submerged under the gum and exposed in a short procedure at a future date. Integration – Commonly, dental implants will be left for a period of three to five months for a process called ‘osseointegration’, essential for creating a secure base for your new teeth. We will replace your missing teeth with a temporary solution during this time. Restoration – After the integration period, we will then finalise your restoration (implant based crown, bridge or prosthesis) for a fixed, permanent result. After care – You then care for your dental implants like natural teeth with regular brushing, flossing and dental hygiene maintenance for a long-lasting healthy smile. 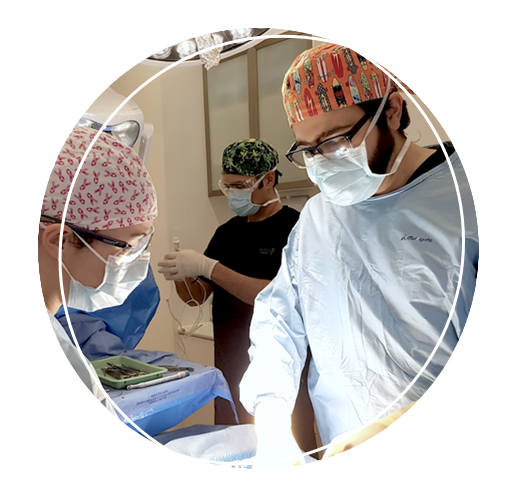 Dr Habibi is our All-on-4 teeth replacement dental surgeon and joins a very select group as Surgical Associate of Australia’s official All On 4 Clinic. The All-on-4 dental implant solution in most cases avoids bone grafting and sinus elevation procedures, or lengthy and staged treatment schedules involved in conventional full mouth or jaw teeth reconstructions. Even cases of severe bone loss or lack of (upper) jaw bone can often be treated immediately with zygomatic (zygoma) implants. Dr Habibi’s years of experience as a dentist practicing exclusively in dental implantology is particularly relevant to the All-on-4 procedure. He has performed both surgery and restoration of several hundred full jaw implant teeth replacements right here in Perth. Less surgery, fewer dental implants and more immediate results means a more cost–effective solution when compared to conventional full mouth implant reconstructions. The procedure typically takes 1-4 days. At your initial consultation, Dr Habibi will assess your situation and advise if the All-on-4 solution (or any other solution) is suitable for your requirements. Following an X-ray, photographs and examination, the details of what is required and what can be achieved will be discussed with you. A 3-D scan of your jaw is carried out and impressions are taken of your current teeth or gums. Your surgery is planned in precise detail. 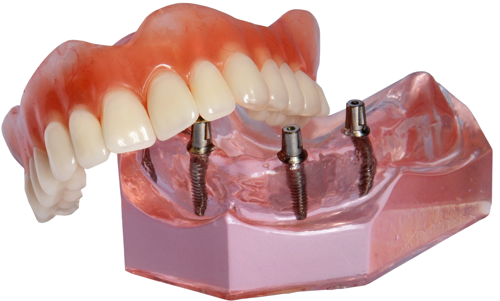 Implant Surgery The jaw bone is prepared and shaped to act as the ideal foundation for the dental implants. Usually just four dental implants are placed at special positions and angles to act as a foundation for an entire new set of teeth. The wounds are closed with dissolving stitches and impressions are taken. This procedure can be performed under local anaesthetic, but most patients choose to snooze comfortably through the procedure using our deep sleep IV sedation technique. 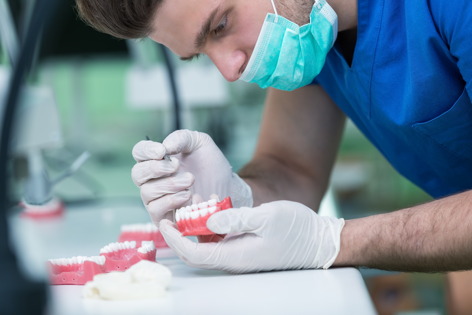 While for many patients this new set of teeth can last forever, some patients, including those with particularly strong bites, may require refurbishment or upgrade of these teeth in the future. This can be done easily with no further surgery or implants required. Dr Habibi will already have impressions from your original surgery, which can be used to make new teeth. To find out what your dental implants will cost, and to book an appointment for an assessment, please contact Complete Implant and Sedation Dentistry today. Telephone +61 8 6380 5899 or send an online enquiry.